Espresso brewing is a complicated set of variables which we as Barista's control to result in a consistent product - caffe espresso..
To ensure consistency we must reduce variables to one to get a controllable which will determine the product - the grind, adjusted to maintain that perfect extraction rate of 25-30mls in 25-30 secs..
14/60= 0.23 18/50=0.36 i know this is a simplification, ignoring so much, but do these different ratios represent the same product, at what point does an espresso become a ristretto (defining by flavor, not volume) as you increase dosage? are updosed shots under-extracted? Whether or not a shot is considered to be over or under extracted highly depends on how much desirable mass is present to extract. This is related not only to the weight of the dose, but also to its contents. How much of that weight is cellulose? How much of that weight do we actually want in the cup? Clearly, the migration of the espresso has brought with it the idea of new styles of blending, or even the complete absence of blending. No longer is every espresso based on the basic "parts list". This has changed everything about the way we approach espresso. That having been said, "ristretto" be under-extracted, but it is not necessarily so, since it's a function of a ratio of volume and mass. Though, I would not venture to hold on to some old belief(of mine) that every ristretto is under-extracted. Under-extraction seems to be the typology of the method. It hardly seems relevant for most common bar drinks. Maybe I halp,maybe confused coment all please love to be wrong its the only way to learn. Great subject to talk about. I do think Jason's post hit the nail on the head way back when. Underextracted, overextracted, properly extracted... it depends on whether what is left in the cake when you stop the extraction could have contributed something desirable to the cup. Or something that YOU wanted to be there. Regarding the espresso vs ristretto question... I guess that depends on which definitions you subscribe to. I like the concept that "espresso" encompasses a range of drinks varying in volume and strength, but all being very small and relatively concentrated. The prototype drink is the normal espresso - embodied by the SCAA definition. Within the general definition of "espresso" live the subsets "ristretto" and "lungo". So I personally consider a ristretto to be a specific style of espresso, even though it doesn't meet the strictest SCAA definition. It is kind of an interesting question though. The only reason that I think that ristretto is still an espresso is that they share the same spirit. They are both meant to be small, crema topped, concentrated portions of coffee bean "essence", just taken to different degrees. By the way, the "huh?" was directed at Jmy's post. Degree of extraction seems pretty relevant to me, even if diluted. Perhaps you could clarify? So much of our espresso terminology has been given to us by the Italian coffee culture. The reason for this is because Italy is where this concentrated coffee form was originally launched, and eventually sophisticated. Once the 1980's Espresso Revolution began on the West Coast, many Italian roasters shared their knowledge and terminology to help us produce better espresso through better extraction. So to better understand espresso, we can look to the Italian roots. Espresso has now become internationally popular. Ristretto in Italian means ristricted. 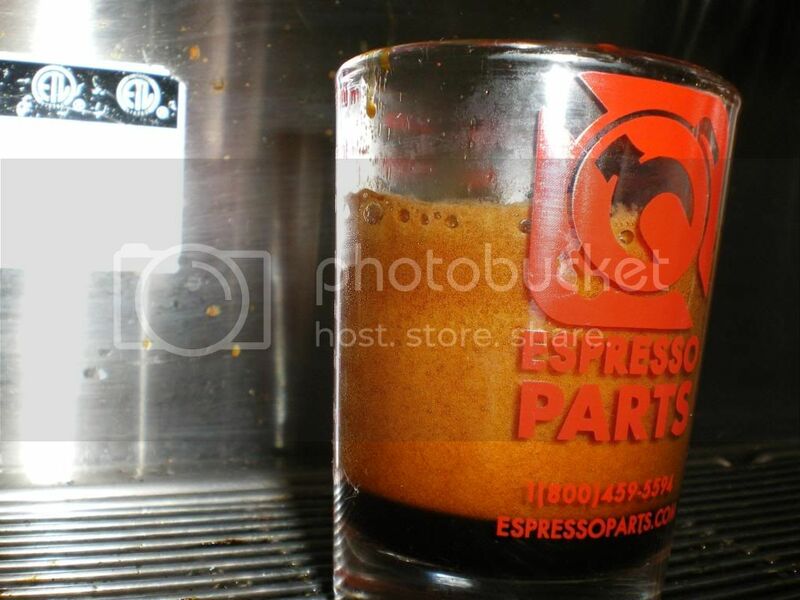 Water is the espresso component that we restrict when pulling an espresso ristretto. So we are dosing with slightly less water in order to gain body and strength. This is related to the old Italian expression, Less is more! Lungo in Italian means long, or long pour. Again, water is the component that is being changed. In this case, to dose slightly more water during the extraction. 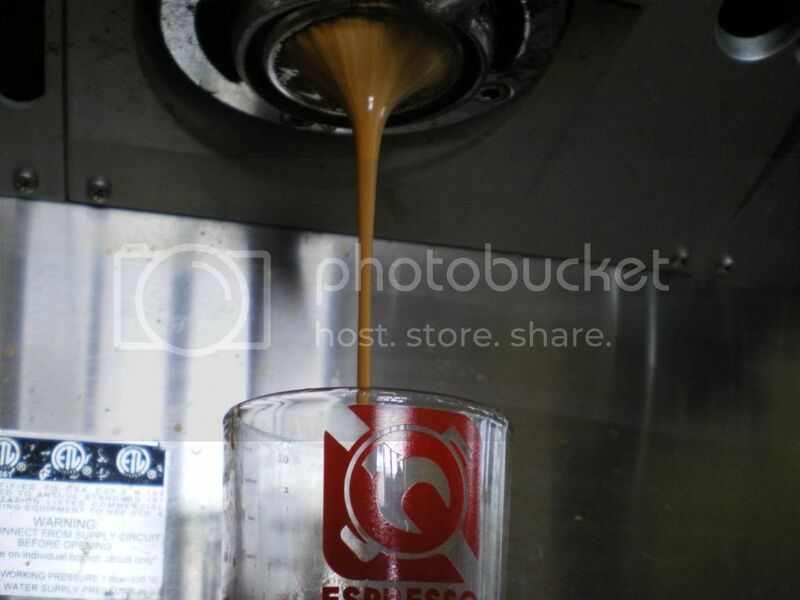 In the Seattle and Portland markets, as well as other espresso markets, most of the high volume, high profile espresso bars and coffee houses have the habit of pouring all double ristretto shots. The water calibration for ristrettos goes like this: First remember that once the water doasge has been set, a portion of the water remains in the spent grounds and never reaches the pouring glasses. To better understand the process, lets begin with the water dosage only, no coffee. Prepare the water calibration by using a double portafilter and pour in to two 2 ounce shot glasses, which will be marked with a white one ounce measuring line. Adjust the water dose to pour exactly one and a quarter ounces in each shot glass. The results will produce a total of two and one half ounces of water from the amount of both shot glasses. Once the water calibration is completed and the shot glasses are cleaned and preheated, add coffee to the double portafilter. So that we are all on the same page, and argument sake, lets run a test using approximately 16 grams of coffee, dose up or fill and scrape method ok, grind the coffee to the consistency that will permit a 25-30 second pour. Pull your shot. 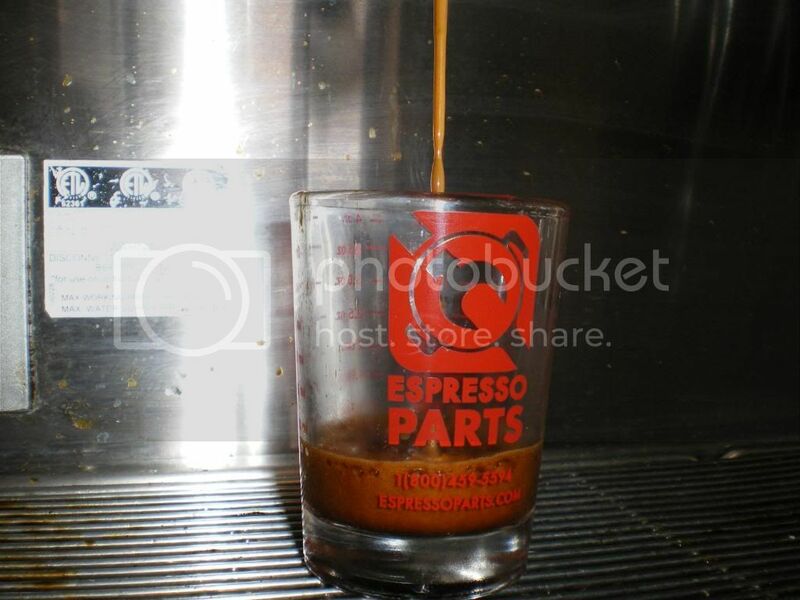 You should see nice thick crema over heavy bodied shots equal to 3/4 ounce of espresso per shot glass. This results in one and one half ounces of ristretto espresso into the drink. The drink that I most enjoy is a double ristretto espresso, macchiato. A double short pull of espresso (3/4 ounce per shot) marked with a small amount of textured milk foam. Or one can certainly order and enjoy a double ristretto short, tall, or grande mocha. Rule of thumb on length of time on a shot is to go with the apprpriate time guidelines( 25-30 seconds). These are generally suggested by the roaster, as they know their coffees better than you or I. However if your shot begins to thin out, stop the extraction. This means that you have extracted all of the good oils and flavors. Order up! One double espresso macchiato to GULP! While it is fairly obvious that you are trying to clearly define "ristretto", there is much to consider when reading your description. You've stated that roasters always know their coffee better than "you" do, but this is not always the case. I have seen many instances where this is, in fact, NOT the case. There is much to know about a coffee, and how it behaves as an espresso is only one facet. When the espresso end of the coffee is the topic of discussion, I will argue that the conscious barista who habitually pays close attention to their products will know the coffee better than their roaster. Again, this is not always true, but I would imagine that those who work with the coffee in that element more often will be those who understand it best within that context. Another dilemma is the assumption that the extraction ratio remains the same when the volume of water is adjusted. How solvent is the water being used? How much of that 16g mass is dissolvable? How much of that dissolvable mass is desirable? This will fluctuate from crop year to crop year, let alone origin, roast profile, or the blended combination of all of those as well as unmentioned variables, not only at any given moment in time, but also to be accounted is the difference in relation to the resting period since the roast, and, following, the gas content. I can notice a difference just in roasting styles, beyond final temperature and agtron number. Each coffee hits "optimum" extraction at different dwell times. To generalize that category into a 5 second window of time is optimistic, at best. The point is that if the "rule of thumb" variables will shift not only across different coffees or blends, but also across the life of that coffee since it was roasted, it doesn't make sense to generalize all espresso into such a specific parameter. I appreciate the reference to Italian coffee tradition, and how the love for espresso has spread internationally in a relatively short amount of time. It should also be remembered, however, that Italian espresso has a certain tradition to it. The Northern blends are all fairly similar in profile and contents, for the most part, and while this is the style most here would look towards mimicking most, not all are looking to follow in the same path, and not all blends subscribe to the same traditions as "optimum" for each one's unique expression. So we are back to square one. How does one define ristretto? It seems that unless we compare all espresso to one basic tradition, we lack the reference to really define it accurately. Therefore, I submit that it is not a particular set of parameters that define "ristretto", but a particular set of concepts. "Ristretto", then, is more of an approach to whatever parameters are considered to be "normale" for any given coffee or blend, which I would be hesitant to group with any existing ideologies due to the sheer number of variables affecting the outcome. Consider further the fact that varying the brew pressure will yield huge differences in the cup, it seems that trying to define "ristretto", "normale", or "lungo" tangibly is a lost cause. I prefer to stick to the "approach" theory. Agreed with Jason, again, especially since the standard volumetric definition does not address the subject of the original post - the nature of an updosed shot. hmmm... thought another minute and this is not totally true. The volumetric definition does give us some useful info. However I do still feel like the conceptual definition is much more useful and flexible for this discussion. I agree that volume of water does have something to do with it, but this volume will vary across time with the same coffee so much, that it hardly seems worth measuring for communication purposes. That is 75ml pulled through 21 grams, call it what you will I drank it and truly enjoyed it.